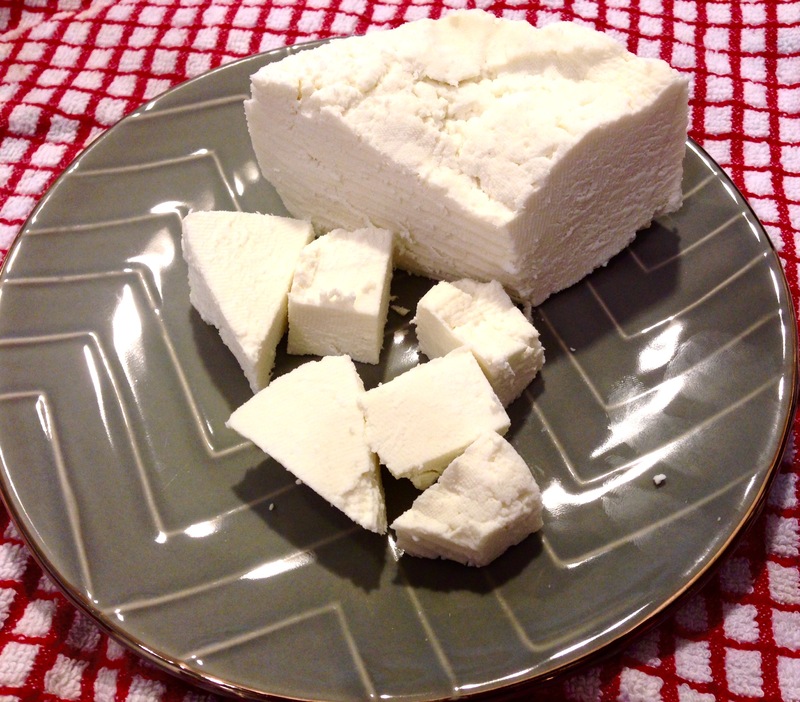 Paneer (fresh cheese) – One Half Indian. It has been an Indian weekend! My husband and I have been enjoying matar paneer, home made breads, and many other Indian recipes. We even went to an Indian play performed in Hindi at UNC Chapel Hill last night. The play was called Meira Vo Mutlab Nahi Tha starring Anupam Kher, Neena Gupta, and Rakesh Bedi. It was cool to see some well known Indian actors in person. I didn’t understand most of the play, but it was fun to try to catch words and see everyone all dressed up. We’ve been going crazy over home made paneer around here, and once you try it, you’ll know why. It has such an amazing texture and fresh taste. I was putting off trying to make it because I thought it would be tricky, but it is honestly one of the easiest Indian foods I know how to make. Also, it is way cheaper to make this stuff homemade than to buy it in the stores. 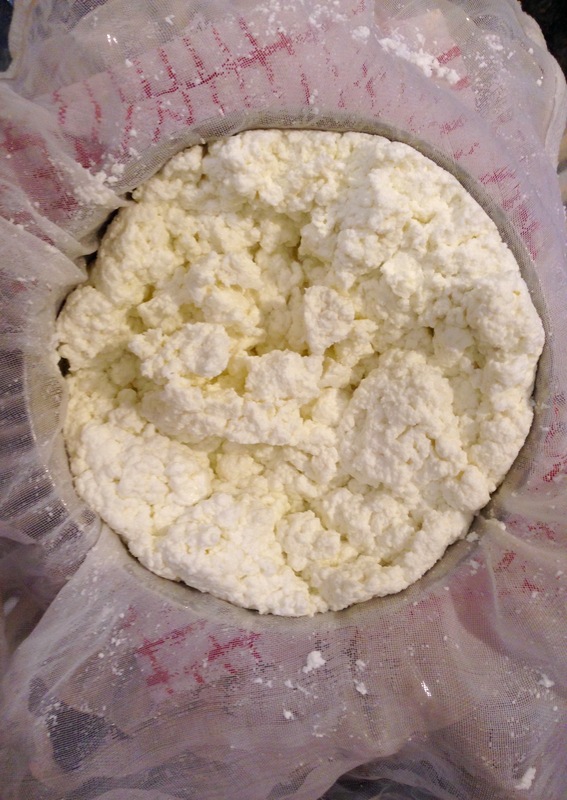 While making homemade paneer, be careful not to cook the milk too long after curdling. You want to remove the curds from the stove right away in order to avoid the paneer becoming too hard. You can use lemon juice or vinegar for the acid to coagulate the milk. If you use vinegar, just rinse the curds before wrapping them up to sit. When you add the acid, your milk should coagulate to the point of seeing the cloudy whey. If your milk did not coagulate that much, just add more aide 1/2 tbsp at a time. In a heavy bottom pan, heat the milk on the stove. Bring the milk to a boil stirring frequently to avoid it burning. Once the milk begins to boil up the sides of the pan and is at a rolling boil, add the acid. Once you add the acid, stir the milk. It should begin to curdle right away. You should be able to see the cloudy/greenish whey separated from the curdled milk. If your milk isn’t completely curdled, add more acid 1/2 tbsp at a time. Once the milk has completely curdled, remove it from the heat and drain in a sieve lined with cheese cloth. If you used vinegar, rinse the curds off in the strainer. Wrap the curds up in the cheese cloth and squeeze out any extra moisture. Wrap the curds in the cheese cloth and set on top of a folded towel to catch any extra moisture. Place a weight on top. I used my mortar pestal, but some plates could work as well. Let the paneer sit wrapped for 1-2 hours. Unwrap the paneer and store in the fridge. If you find your paneer is hard, you can store it in a container with some water to help keep it soft. The first time I made paneer, I was amazed. It was like magic! Creamy magic. Thanks for reminding me. I’ve been wanting to make my own cheese, and this looks ridiculously simple! I am really excited to try it! This is SO simple! You should totally try it out! Thanks for stopping by!